Exploration geologists and geophysicists working for gas producers locate potential underground natural gas deposits contained in geologic formations. Wells are drilled to extract the natural gas and well site facilities are then constructed to produce and measure the gas. Natural gas from individual wells is transported to gas processing plants via gas gathering systems, where it is refined for domestic consumption by removing natural gas liquids and other impurities, such as ethane, propane and butane. Alberta Energy, a department of the Alberta Government, oversees the development of provincially-owned energy and mineral resources. The production of natural gas in Alberta is regulated by the Alberta Energy Regulator (AER), and by the Department of Environment. Gas producers pay a royalty share of their product to the Alberta Government and may sell their natural gas in a number of ways, such as at the wellhead or at outlets from the gas processing plant, onto a gas transmission system or directly to utility companies and end-use markets. When natural gas leaves the processing plant, it is gathered in increasingly larger pipelines until it reaches high-pressure transmission pipelines, which move the gas to major markets and areas of high consumer demand. 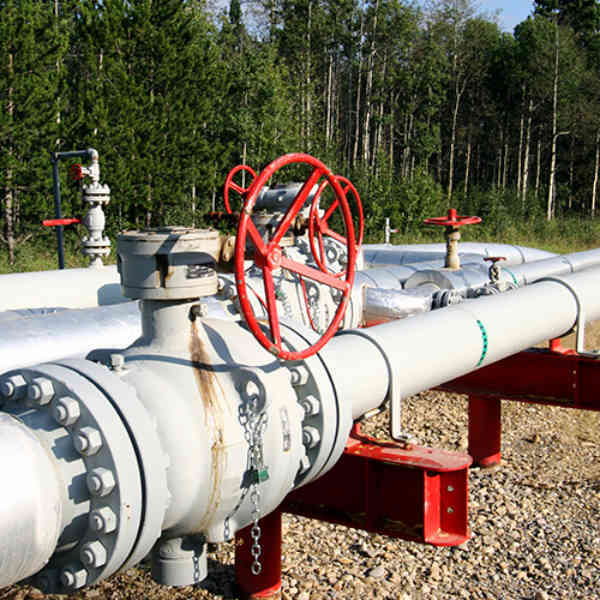 TransCanada Pipelines Ltd. (TCPL) owns and operates the NOVA Gas Transmission Ltd. (NGTL) pipeline system, which is the primary gas gathering and transmission pipeline system in Alberta. TCPL collects natural gas from hundreds of producers and transports it to gas utilities and industrial consumers, as well as to export pipelines at the Alberta border. Natural gas exported out of the province is transferred to pipelines at the BC, Saskatchewan, or Montana borders. The National Energy Board (NEB) is responsible for approving the construction and operation of the NGTL system, including regulation of rates and tariffs. 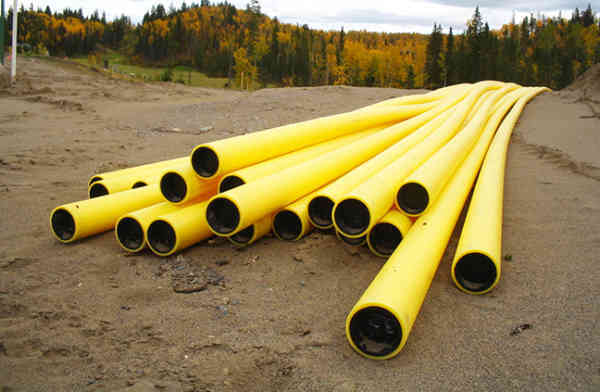 ATCO Pipelines Ltd. owns a smaller gas transmission pipeline system in Alberta, which primarily operates closer to the larger cities in the province. Gas Alberta Inc.’s customers own and operate over 700 meter stations, which are the receipt points for natural gas deliveries from transmission pipelines throughout Alberta. Meter stations regulate gas pressure, measure volumes delivered and inject odorant into the distribution pipeline systems. Natural gas flows from our customers’ meter stations into their distribution pipeline systems. These systems are comprised of various sections of pipelines that have regulators to control the gas pressure in each section. In general, both the diameter and gas pressure of the pipeline decrease the closer it gets to the end users’ location. 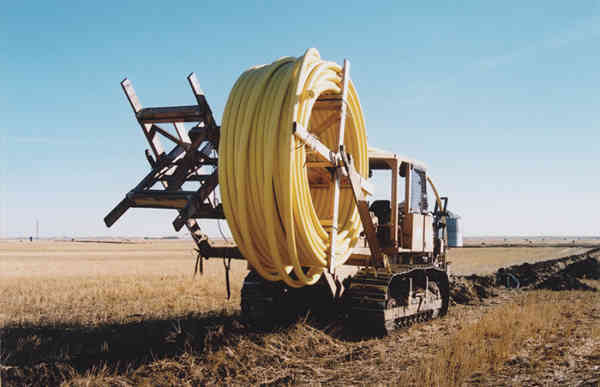 Natural gas typically flows from distribution mains into a home or business through a service line. These are small diameter plastic lines that measure an inch or less in diameter with pressure as low as one-quarter psi. Each utility continuously monitors the pressure in their distribution pipelines to ensure that the natural gas delivered to each consumer has sufficient pressure to operate their equipment and appliances. Gas meters measure consumer usage in hundreds of cubic feet (Ccf) and this information is typically transmitted back to the utilities via automated meter reading (AMR) equipment. Investor-owned distribution companies are regulated by the Alberta Utilities Commission (AUC) to ensure their natural gas rates are just and reasonable. Municipal councils are the primary regulators for municipally-owned utilities and elected board members are primarily regulators for each natural gas co-operative. Municipal utilities and natural gas co-ops operate with oversight from the AUC and the Rural Utilities Branch of the Department of Agriculture mainly to address consumer complaints.